Heavy rains this week in Aitape has caused rivers to flood villages, schools and hospitals in the District. 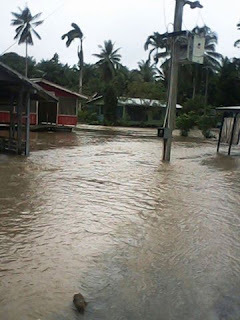 The Raihu River burst on Tuesday, which resulted in flooding around the Raihu Hospital and Saint Ignatius Secondary as well as nearby areas. This has forced the shutdown to services at the Hospital while Saint Ignatius Secondary School was also flooded. It is good to hear though today that the hospital opened for normal services yesterday. Most schools and other areas are also still under water but the tides have slowed down and schools may also be able to resume in term two.